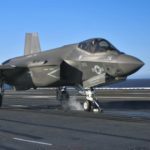 Shares in Lockheed Martin (NYSE: LMT) traded down approximately 5 percent as noon Eastern time approached Monday after President-elect Donald Trump criticized the F-35 Joint Strike Fighter program on Twitter in the early morning hours. “The F-35 program and cost is out of control. Billions of dollars can and will be saved on military (and other) purchases after January 20th, ” Trump tweeted at 8:26 a.m.
Bethesda, Maryland-based Lockheed saw an estimated $4 billion hit to its market capitalization after the tweet. Losses among several other large defense primes followed to drag Executive Mosaic’s GovCon Index nearly 2 percent lower halfway through the trading session to halt a sharp post-election rally on investor optimism that military spending will increase under Trump administration. Lockheed was also the largest drag on the Index in terms of net movement and was followed by other primes Northrop Grumman (NYSE: NOC), Raytheon (NYSE: RTN), Huntington Ingalls Industries (NYSE: HII) and General Dynamics (NYSE: GD). Boeing‘s (NYSE: BA) stock held flat as of midday Monday and the airplane maker felt a similar hit to its shares in early trade on Dec. 6 after Trump called for the cancellation of the company’s contract to build the next Air Force One from his Twitter feed. Shares in Boeing have risen 2.67 percent since. The F-35 program’s costs have totaled nearly $400 billion since its 2001 inception and have almost doubled over that time.